It’s almost Valentine’s Day! If you’d like to wish a fellow Pogoian a Happy Valentine’s Day, please do so in the comments section below. I’d like to personally wish you all a very lovely Valentine’s Day. I really appreciate you being here and I hope you feel the Pogo love. How’s everyone doing with the Winter Journey Challenge Quest? Are you making good progress? The animation is really fantastic. To see it, you’ll have to wait until March’s Badge Marathon and then make your way to the finish line. You can do it! Ten-Game Badge Marathon – Begins February 15. 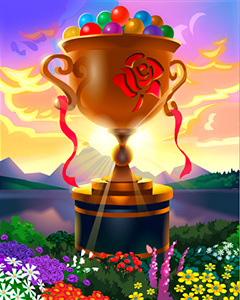 Solitaire Gardens Badge Marathon – You’ll be able to give your green thumbs a workout on this one near the end of February. Magic Marathon – Slated to begin in March. Ten-Game Badge Marathon – Mid March. Poppit! Party – The image of Ringmaster Spike was updated to hold some tasty cotton candy in today’s release. Poppit! Bingo – An issue with the game screen freezing for some players has been fixed with today’s release. Cookie Connect – New levels and Badges are now available. Click here to play! Jet Set Solitaire – New levels and badges are now available. See the sights in Hong Kong, Istanbul and Seoul. Click here to play! A Way With Words – New badges and Challenge number 3 slated for March. Claire Hart: Secrets in the Shadows – Free Valentine’s Day Episode arrives February 13. Trizzle – Slated for February 28. The Flash version of Trizzle will go offline on February 26. The new HTML5 version of Trizzle will go live on February 28. All the Power-Ups that you purchased in the Flash version of Trizzle will be owned by you in the HTML 5 version of Trizzle! Please note that all free Power-Ups that you have in your collection will not transfer over. Please also note multi/cross item bundles will not be available at this time but you will be able to purchase them separately. Learn more about this HTML5 update here. Sweet Tooth Town – Our biggest match 3 game ever is coming February 26. Coming in the first half of 2019 – Word Search Daily HD, Pogo Daily Sudoku (a brand-new game), Mahjong Garden HD and many more. Please note, after March 7, 2019 there will be no new items added to the Pogo Mini Mall as we focus on bringing new content and updates to other parts of the site. Your wardrobe of Mini items will remain available to you, along with tons of items in the store. Tokens – As many of you are aware, the current token system will be replaced with a new awards system. As stated in a May 2018 blog, I, and the rest of the Pogo team, know this is a point of contention for some of you. For those of you for whom tokens provide a way to project status and achievement over time, we hear you and we understand your aversion to losing this status. Tokens in the current Flash and Java games will remain and will not be removed. We thank you for your understanding. Stay tuned for more information about the upcoming system. Pogo recommendations and specifications for your computer have been updated as of August 14, 2018. These are the recommended specifications for playing Pogo games smoothly on your computer. If you are experiencing loading issues, I strongly encourage you to check out the computer specifications listed. Having a compatible computer helps ensure the best possible Pogo experience! Chat – We know a lot of you guys love chat and consider it a critical feature. We’re aware of the many requests for chat to be updated and to be returned to the side of the game screen. The team here is looking into it. I’ll give you an update as soon as I have one! Q. Are there more Badges after a player reaches 1000 Collectibles in each rank in Poppit! Bingo? A. First off, huge congratulations to anyone who has made it that far! Thank you for your dedication and love of Poppit! Bingo, which is one of my top three Pogo games. To answer your question, we do not currently have Badges beyond that milestone, but I put a request in. The team was very excited to hear people were asking. Before I head out to go fill up a nice warm mug of tea, I want to ask you to comment below with any (non-technical) questions for Pogo Terry about Sweet Tooth Town and questions for Pogo John about the new HTML 5 update to Trizzle. I’ll be having a Q&A session with both of these fine gents for an upcoming Pogo Insider. Have a terrific and super fun week here in Pogo. Always remember that you matter and you can do it! What?! Having trouble finding enough positive comments to actually accept some? Wow, what a surprise. Or not. Happy Valentine’s Day, Pogo Llama! Pogo Llama I really hope the team considers or revisits putting more mini items out in the future. Everyone loves them and it is amazing for the great outfits and pets and backgrounds. There is so many older people or disabled people that use Pogo as therapy and I hope Pogo doesn’t forget us. So many things are changing and the chat and tokens and mini items are the things each of us looked forvvard to. Thank you for the games and for considering great things for Pogo nuts. I will certainly pass this request for the Mini Mall onto the team. Thank you for writing in with your thoughts and for being a part of Pogo. Happy Valentines Day Wayne Dizzylittle and Every one on pogo Good Luck. I am so glad to see some of my favorite games updated and included in the HTML transfers. I totally understand all the work that goes into making these games available (and much better) for we Pogoians. Thanks to you Pogo_Llama and Pogo for keeping us informed of all the changes occurring. Oh, yessssss and I love all the challenges and marathons!!! Thank you so much for your feedback and I’m glad to hear you’re enjoying all that Pogo has to offer. Take care and have a good, fun, weekend. I really wish you would please slow down on the badge marathons! Not enough hours in the day to work, live, clean, etc. to try to do so many in such a short period of time. Thank you for your thoughts on the volume of Challenges. There are many different styles of players here in Pogo and while some do not wish to complete all of the Challenges, there are a number who relish in them. Due to that, we want to make sure to reach all of our players request. I really do urge you to complete only what you feel comfortable completing. The most important thing is to have fun here in Pogo. Pogo is a place and source of fun, so please pace yourself and do what feels right to you as far as how many Challenges you take on. I don’t want you to stress and I thank you for sharing your feedback. Very cute badge for spring, shall see if its anything i like to play as to wither i may play it or not. Poppit Bingo badge i could not get that was too much sitting time for me to try. I enjoy bingo but not that challenge!! Keep looking for chat updates, Hoping it will go back on side for us who needs full screen so we can enjoy chat too. I have a feeling you’re in some of the states being hit by a lot of snow. I hope you keep warm and safe out there. Remember, spring will be around the corner. Have a fun week here in Pogo. Loving the new Poppit! Party costumes. However, I wish there were badges for getting costumes to level 10! In Collection 1, I have 15 of 20 costumes maxxed out at level 10, and in Collection 2 I have one maxxed out at level 10 already. It would certainly make more sense than having a badge at level 4! A badge for unlocking a costume makes sense, as does one for level 5, since that’s halfway to maxing out. But level 4 seems so random? Level 10 would fit better and feel better to earn, as it’s a LOT of work to get to. Thank you for your suggestions and I have passed them along to the team. I’m glad you’re loving the new costumes. Which is your favorite? I was wondering how many levels are at Poppit Party? HAPPY VALENTINES DAY TO ALL. While there are not really levels in Poppit! Party, there are characters and within each character, you will have items to open up and such. Right now, you have a total of 30 characters available. I was under the impression that any owned games from the original Claire Hart was going to be left to the player who owned them. I was given many free games as a pogo club member. I no longer have those games which I really liked playing. I now only have two of the games left to play. So, won’t be playing this one either any more, unless there is a challenge for it. Very disappointed. I am a bit confused. Do you mean the Claire Hart Soul Searcher Episodes? If so, all Episodes that you had previously purchased, were to transfer over to the new Claire Hart Classic. If this is not the case, please contact Customer Support by clicking here. Why do the HD games not load on my computer? please tell me what I need to do. Unfortunately, I’m unable to troubleshoot here in the Blog. Please take a look at this page to make sure you’re using the correct specifications for your computer when playing the H5 games. If those tips do not work, please reach out to Pogo’s Customer Support team by clicking here. Thanks for your patience and understanding about chat. Happy Valentine’s day, Debbiebeachgirl4! Happy Valentine’s Day Llama have a great day. Enjoy your candy or flowers. I love peanut butter candy the most so hope my Valentine brings me candy. Hugs to U.
Yummy! Peanut butter is tasty. I hope you get some from your Valentine, too. Happy Valentine’s day to you! HAPPY VALENTINE’S DAY to all! Have a great week and weekend. Hi Pogo Llama and Happy Valentines Day! I haven’t been on a whole lot when it was Christmas because that is the best time to enter sweepstakes online and win some great prizes lol. I had a few great wins. I did spend some time in Pogo and wanted to say what a great changes have come in. I really like Mahjong Safari. I bought as many as I could of the cute Christmas badges too. I am really looking for to the new Sweet Tooth and other games that are coming this year. I did want to ask, maybe a couple of question’s for the team. When we choose a badge we want to display in our profiles, it also asks if we want our mini to show in a game room or our badge.The new game rooms, it will display only the mini and I like it to show my badge. Is that something they can work on so it’s one or the other we choose? I think I mentioned this before but in Tri-Peaks Solitaire, the cards in the chest that were funny in the flash game aren’t in the HD version and it would be great if they added those back in along with some new ones. For Pogo Terry, what is the new type of game interaction’s we will see in the new Sweet Tooth Town? For Pogo John will there be anything new with the HD release in Trizzle? For Pogo Tony, the new badge he gave a glimpse of looks amazing!! Thanks for all your hard word Pogo Llama and the Pogo Team!! Thanks for your questions for Pogo John and Pogo Terry. I will send those questions over for the next Pogo Insider blog. I appreciate your game request for Tri-Peaks and also the feedback on the ability to use a Badge image instead of a Mini. Thanks for your game requests and you can be sure I’ll keep you all posted when I hear more. You’ll find all game updates in the Construction Zone section of the bi-weekly Pogo Insider blog. First off Happy ♥ Day!!! Pogo Tony really is such a talent. I saw the Blooming Lucky Badge and just had to share. 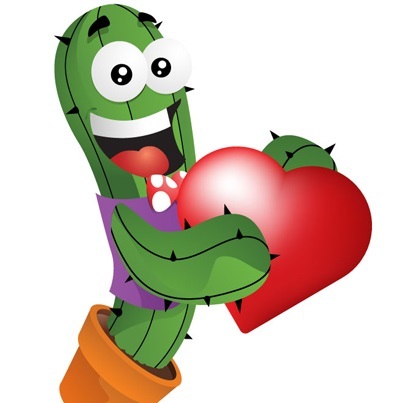 Have a great week here in Pogo and Happy Valentine’s Day. Hello, I love this site, I spend a lot of time here every day. I can play Claire Hart Classic okay, but I can only get through one chapter of the new one, Secret… and then the screen freezes up and I have to get completely out of my browser to clear it. I have seen others having this problem also. Can you help? Love Quinn’s Aquarium by the way, great game. Like working towards building something, it makes it more fun. Anyways, I can’t get the badge this week because I can’t get through the chapters without freezing up. Well first off, I’m so glad to hear you’re a fan of playing Quinn’s Aquarium and thank you for letting me know that. Hmmm I’m not sure why your screen would freeze up with CHC. Unfortunately I’m unable to troubleshoot from the blog. Please click here to contact customer support. Thank you and please have a good, fun, week here in Pogo. why are all the old games like jigsaw and crazy cakes and fortune bingo etc. all on such small screens. its hard to play them. also Pogo Llama can Pogo give us a little more variety on challenges other then the finding object games . My eyes are getting tired and so am I from them.All of you at Pogo Happy Valentines Day. Thanks, Bvlady and happy Valentine’s Day to you. Hi “Pogo Llama”. In re Poppit! Party’s newly released Collection #2 Costumes, Why Pogo doesn’t award “completions” badges for reaching or completing Level #10? After one has earned all the Level #5 badges, there’s very little incentive to play because Pogo didn’t add any “In Game Achievement Award” badges including “rank”. I’m currently working on the levels #6 to #10 with no incentive to play because there are no badges to earn. Thanks in advance and Happy Valentine’s Day! Thanks for playing Poppit! Party and I hope you’re enjoying the new Costumes. I’ve passed along your feedback to the Pogo team and I know they’ll appreciate it. Thank you for your feedback, Niqy78. Happy Valentine’s Day to you. we are working for now is awesome too!!! Many thanks to all the Pogo team !!!!!! Awww thank you. I will let Pogo Tony know of your kind words. I didn’t see an answer to my question. I’d like to ask again, how do you open Collection 2 in Poppit Party? At the bottom of the game screen, there’s a “Browse Collections” button. Select that button and you’ll be able to open up Collection 2. Hiya Pogo_Llama, hope you had a lovely Valentine’s Day. I’ve been keeping very busy with the Winter Journey Challenge Quest, Weekly badges, GOTM Badges & also working on some unfinished Mix-n-Match Badge Albums as well! Then there were new levels added to Jet Set, Cookie Connect & Quinn’s..YAY! There’s been so much going on I don’t know which way to turn! AND I LOVE IT! Thank you for making this such a fun place to be! I know you have a lot more in store for us and I am looking very forward to seeing what’s around the bend! 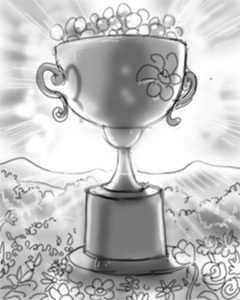 And thank you for the sneak peak of the Blooming Luck Badge! It’s beautiful! I can’t wait to see the animation & to earn it! Thank you for your positive attitude, OneHappyJoy155. It’s so inspiring and a wonderful thing to come across especially early on a Friday morning. Take good care and have a great weekend. I have a question…what ever happened to The Great Pogini? I have not ever heard of this apparent Pogo legend. Perhaps he has disappeared into thin air! I was just wondering why there aren’t anymore site-wide challenges. Is Pogo planning on bringing those back once in a while? Hi KookMop! Thanks for your request and I’ll send it along to the team! Thanks for your feedback, Mary! So glad to have you here in Pogo. I have a comment on the new mahjong safari HD. I think the combo meter is too fast. Is there any chance it can be slowed down? I think it was a little slower than this in the old version. Thanks for your game suggestion, Ranger! I’ll send it over.